US, 1942, 107 minutes, Black and white. Humphrey Bogart, Conrad Veidt, Peter Lorre, Karen Verne, Judith Anderson, Jane Darwell, Frank Mc Hugh, Jackie Gleason, William Demarest, Phil Silvers. 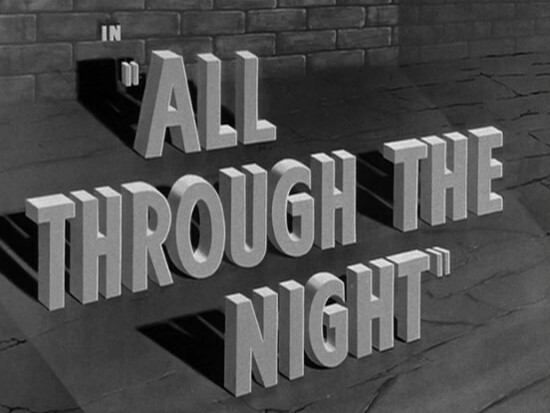 All Through the Night is quite an offbeat vehicle for Humphrey Bogart. He had made his mark in the early '40s with such dramas as High Sierra and The Maltese Falcon. This film came immediately after The Maltese Falcon (and before The Big Shot, Across the Pacific and Casablanca). It is a war propaganda film - but done with the comic touch. It is more in the vein of Ernst Lubitsch's To Be Or Not To Be rather than Bogart's other propaganda films like Across the Pacific or Casablanca. Commentators point out it is a story of Nazis in America encountering gangsters of the Damon Runyon school. While it is rather well-made of its type, the atmosphere of 1942 at its release was not really conducive to appreciation of this kind of antiNazi propaganda - tongue-in-cheek. It has not lasted as one of Bogart's better-known vehicles. The film has an interesting, supporting cast with Conrad Veidt, Peter Lorre and Judith Anderson leading the neo- Nazis. There are comic gangster associates of Bogart played by William Demarest, Phil Silvers and Jackie Gleason. Jane Darwell is Bogart's mother. Direction is by Vincent Sherman (who made such films in the '40s as The Hard Way and the Bette Davis vehicle Old Acquaintance and Mr Skeffington). An offbeat serious comedy. 1. The impact of the film at its time? American propaganda? World War Two? Anti-Nazi? propaganda - comic style? 2. A Humphrey Bogart vehicle? 3. Warner Bros. production values: New York, the atmosphere of the gangster films - with the comic touch? A more jaunty musical score? The editing and pace for comedy and for suspense? The melodramatic finale with the neo-Nazi crashing on New York Harbor? 4. The title - seemingly romantic or comic? A night when gangsters' defeat Nazis? 5. Humphrey Bogart as Gloves - a comic New York gangster, his reputation? Was he really a criminal? His mother's support of him? His comic associates? The police? His friendship with the baker? The murder and his investigation? The encounter with the terrorised heroine? The discovery of the Nazis? The gangsters pursuing them? Attending the Nazi meeting - and stalling for time with comic routines? The final confrontation and heroism? Gloves as a New York hero? 6. His comic associates - the comic character actors and their contributions to mood and atmosphere? To the action? Jane Darwell and her style as Gloves' mother? 7. The Nazi situation in New York - the baker and the pressure put on him? Peter Lorre as the sinister and murderous Nazi? Conrad Veidt and his German background portraying the suave Nazi leader? Judith Anderson as the Nazi leader - but emotionally able to betray when hurt? Characters and caricatures? Their sinister behaviour, their fanatical meetings - also being sent up? Betrayals? Final violence? The plans for mines in New York Harbor and the destruction of ships? The reality of a fifth column? 8. The heroine and her involvement with the Nazis? The encounter with Gloves? His rescuing her? 9. How satisfying a blend of comic gangster routines with more serious propaganda material? A film of its period? A curio for later decades?